The fashion identities in the context of a wider conversation about American nationhood, to whom it belongs and what belonging means. Race and ethnicity, class, gender, and sexuality are all staple ingredients in this conversation. They are salient aspects of social being from which economic practices, political policies, and popular discourses create "Americans." Because all of these facets of social being have such significant meaning on a national scale, they also have major consequences for both individuals and groups in terms of their success and well-being, as well as how they perceive themselves socially and politically. The history of Jews in the United States is one of racial change that provides useful insights on race in America. 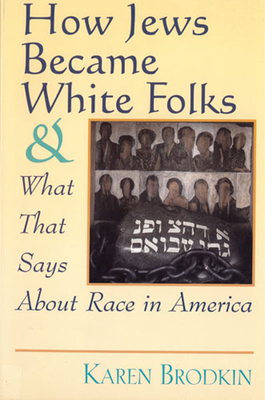 Prevailing classifications have sometimes assigned Jews to the white race and at other times have created an off-white racial designation for them. Those changes in racial assignment have shaped the ways American Jews of different eras have constructed their ethnoracial identities. Brodkin illustrates these changes through an analysis of her own family's multi-generational experience. She shows how Jews experience a kind of double vision that comes from racial middleness: on the one hand, marginality with regard to whiteness; on the other, whiteness and belonging with regard to blackness. Class and gender are key elements of race-making in American history. Brodkin suggests that this country's racial assignment of individuals and groupsconstitutes an institutionalized system of occupational and residential segregation, is a key element in misguided public policy, and serves as a pernicious foundational principle in the construction of nationhood. Alternatives available to non-white and alien "others" have been either to whiten or to be consigned to an inferior underclass unworthy of full citizenship. The American ethnoracial map-who is assigned to each of these poles-is continually changing, although the binary of black and white is not. As a result, the structure within which Americans form their ethnoracial, gender, and class identities is distressingly stable. Brodkin questions the means by which Americans construct their political identities and what is required to weaken the hold of this governing myth.